So excited: One of the 28 artists chosen for the Portland Museum of Art Biennal!Back to BlogMaine Art Scene Magazine selects Abbie Read as one of 5 featured artists for 2013! The Atrium Art Gallery at USM’s Lewiston-Auburn campus is presenting the exhibition “Pollination: Evolving Miracles,” now through June 7. Paintings, drawings, prints, photographs, sculpture, poetry, and video by 29 artists and scientists explore the lively intersection between flowering plants and their pollinators — bees, wasps, flies, moths, butterflies, beetles, and others. In flowering plants, pollen grains are transferred from the male part of the plant called the anther, to the female part called a stigma to produce seeds. This process of pollination has evolved over millions of years and is done by wind, insects and other species. Though honey bees are most commonly thought of as the major pollinators, there are thousands of species of insects that perform this vital function. Native solitary bees such as mason bees, miner bees, leafcutter bees, bumblebees and others have co-evolved with flowering plants to perfectly perform the task of getting plants to develop seeds. Flies are the second most important pollinators and come in an amazing variety of sizes and colors, some which have evolved to mimic bees and wasps. 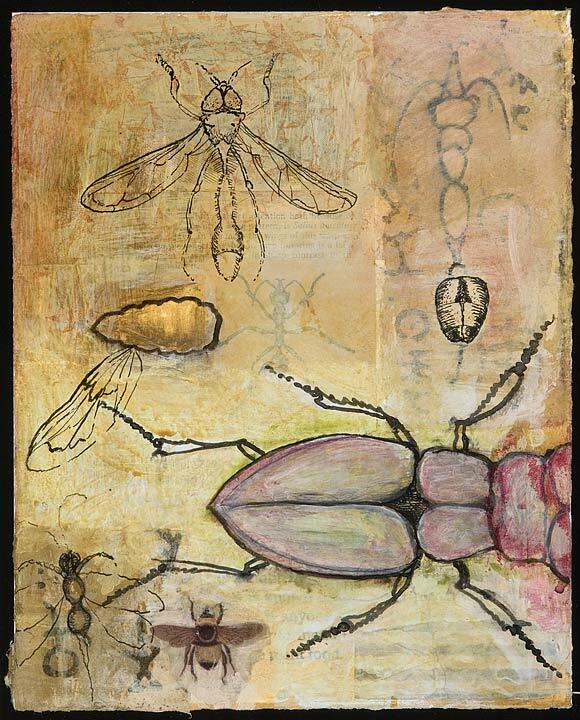 Works in the exhibit include detailed scientific illustrations, imaginative sculptures, book arts, works made with beeswax and pollen, and more abstract pieces. A video by London artist Rob Kesseler, show his remarkable photo-micrographs of pollen grains. Free and open to the public. Art Gallery hours: Mon.- Thurs., 8 a.m.-8 p.m.; Fri., 8 a.m.-4:30 p.m.; Saturdays, April 20, 27, and May 4, 9 a.m.-3 p.m.; closed holidays; 207-753-6500; www.usm.maine.edu/atriumgallery. The exhibition continues through June 7. The Atrium Art Gallery is located in the hub of the University of Southern Maine’s Lewiston-Auburn College at 51 Westminster Street in Lewiston, offering interdisciplinary bachelor and graduate degree programs with both on-site and online classes. Alice Struthers on Maine Art Scene Magazine selects Abbie Read as one of 5 featured artists for 2013!